Do some cultural sightseeing at Seurasaari Island and Open-Air Museum and Museum of Contemporary Art Kiasma. We've included these beaches for you: Aurinkolahti Beach and Hietaranta Beach. Explore Helsinki's surroundings by going to Porvoo (Porvoo Old Town, Cathedral of Porvoo, & more). The adventure continues: browse the eclectic array of goods at Hakaniemi Market, look for gifts at Taiga Colors, get engrossed in the history at National Museum of Finland, and take a stroll through Ullanlinna. For ratings, reviews, maps, and tourist information, use the Helsinki online driving holiday planner . Dallas, USA to Helsinki is an approximately 17-hour combination of tram and flight. You can also fly; or do a combination of car and flight. You'll lose 8 hours traveling from Dallas to Helsinki due to the time zone difference. Plan for much colder temperatures traveling from Dallas in May, with highs in Helsinki at 60°F and lows at 43°F. Wrap up your sightseeing on the 18th (Sat) to allow time to travel to Loviisa. Loviisa is a municipality and town of inhabitants on the southern coast of Finland. 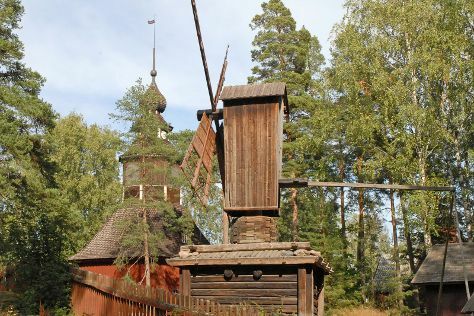 Start off your visit on the 19th (Sun): see the interesting displays at Loviisa Maritime Museum and then take in the architecture and atmosphere at Loviisan kirkko. To find ratings, photos, maps, and other tourist information, go to the Loviisa tour itinerary site . Drive from Helsinki to Loviisa in 1.5 hours. In May, plan for daily highs up to 60°F, and evening lows to 42°F. On the 19th (Sun), wrap the sightseeing up by early afternoon so you can travel back home.